Happy Earth Day! We’re rounded up six great Earth Day activities that are perfect for families ready to celebrate and learn about the Earth together. 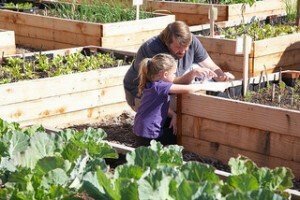 Check out these great ideas for fun learning experiences you can do as a family. 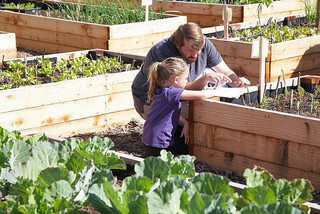 There’s nothing like starting a family vegetable or flower garden together to celebrate the Earth today. First, gather ideas from your family about what types of vegetables and plants you would like to grow and make a plan for where you’d like to plant your garden. Head to the store together to pick out your plants and teach your children about how to find a healthy plant for your garden. After returning home with your selected plants, prepare the area together by getting the soil ready (with some help from Mom or Dad to turn the soil over with a shovel or tiller) and adding any fertilizers you’d like to your plot. Following the directions indicated on the labels that came with your plants, dig holes and plant them accordingly, making sure to leave enough space between plants. Water gently and watch them grow! If you’re not ready for a whole garden, your children can still gain some plant experience with some simple dried beans. Gather some dried beans, paper towels, some dirt, and a glass jar (recycled is best!). Place a wet paper towel inside the glass jar and fill it with enough water that the paper towel will stay damp. Slide some beans, between the glass and the paper towel. While it will take a few days, you and your children will start to notice the beans sprouting if you make sure to keep the towel damp. After about three days, remove the beans and paper towel and fill the glass jar with some dirt. Plant the beans into the dirt and in just a short time you’ll have little bean stalks. If recycling isn’t part of your routine, take time out on Earth Day to set up recycling for your home with your family. Getting designated bins to put in a special area will help your family recycle better. You can decorate the bins together so they’re labeled with the appropriate type of item for you to prep your recycling for pick up or drop off on trash day. Talk about recycling with your children and why it’s important to do the three R’s: Reduce. Reuse. Recycle! You can even call your local waste management facility and see if they’re giving tours for Earth Day to learn about what happens to your trash. Take a trip to your local library or look for resources online and grab some books about tree identification. Sit down together with your family to go over the different features of types of trees, like the bark and leaves, and then go outside and see if you can identify trees correctly around your home. Bring some paper and crayons to take some bark rubbings to help your children learn to identify different bark patterns. If you’re feeling very creative, you can even make some drawings out of your rubbings! Go for a walk in the woods together and bring some flower, bug, or bird guides with you. Let your children explore the area around them and try to figure out what all the different creatures and plants are around you. If you live in an area where there are nature lover groups like the Audubon Society or a park service, see if they have any special outdoor activities for Earth Day. Many groups put on special presentations or nature walks to share their love of the Earth. Even if there aren’t any in your area, you can plan your own together and let your kids put on a show for you or their friends. Gather some paint and objects from outside, like rocks, sticks, flowers, leaves and other bits of nature, and bring them to life with art projects. Use paint to make your own Earth with your hands or paint your found objects to decorate them. You can even make impressions of your leaves by painting them and them pressing them to a piece of paper. While it might be messy, it’s a whole lot of fun! We hope you have a wonderful Earth Day with your family. After you’ve had fun planting a garden or playing outside, don’t forget to pick an Earth friendly and health snack. Fruti frozen fruit bars are non-GMO certified and help protect the existing ecosystem. Wonderful ideas!!! We planted a garden this year for the first time. Those are some good suggestions to try together as a family. Great ideas. Did two of those today…gardening and a hike! Thanks for submitting to Green Living Thursdays on Dude, Sustainable! Hope you come back next Thursday!